Our galaxy, the Milky Way, contains at least 200 thousand million stars, a number too large to comprehend, and certainly a number too large to render with a commercial software package. In addition to the stellar population, there are countless regions of nebulosity, star clusters, and lanes of gas and dust. Traditional methods require many expensive days in order to build a 3D model of our galaxy, and the result would contain thousands of stars, not millions. Planetary Visions, however, has developed a specialised galactic renderer, capable of taking in any flat picture of a galaxy, and producing a complex 3D model, complete with clusters, dust lanes, and a galactic core. This unique software creates a model based on the correct statistical distribution of types of stars throughout the galaxy, and builds a galaxy true to astronomical science, not artistic impression. The process builds a galaxy with at least 60 million individual stars, and does it in minutes, not weeks. Each star, of over 60 million, is an individual light source, and any flightpath can be constructed that allows the camera to fly to any star. The stars are modelled and rendered with the correct colours depending on the spectral distribution of stars throughout the galaxy. Globular clusters, large spheres packed with over 100,000 stars, orbit our galaxy in a halo. Each globular cluster is positioned accurately and the camera can even fly through a globular cluster, as it too, is modelled as a 3D object. Dark lanes of gas and dust are modelled according to their real distribution as observed by radio telescopes. 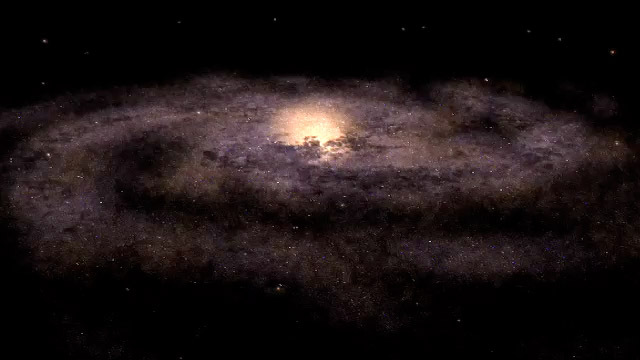 The unique software developed by the Planetary Visions team is not restricted to our own galaxy - it can model and animate any galaxy in the Universe for which there is available an astronomical image. For other galaxies, the distribution of stars, gas and dust is determined by a scientific analysis of a genuine astronomical image of the galaxy. This allows Planetary Visions to produce galactic animations that show that galaxy in full 3D, as never seen before.